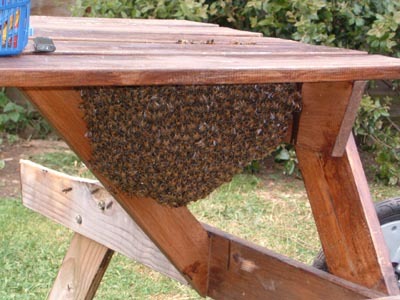 During the spring & summer swarming season (April-July), NBBKA are offering a swarm collection to the general public. Call our hotline number below to talk to someone about your swarm. Please answer these questions in order to see our hotline number. Question 1 - What type of bees do you have? Do the bees live in a small space such as a birdbox, hole in the wall, or underground? They're probably other types of bee. Left: mining bee; right: mason bee. Are the insects smooth, with very pronounced yellow and black stripes, with red legs? These are probably hornets. Are the insects smooth, with very pronounced yellow and black stripes, with yellow legs? These are probably common wasps. If you see this insect, with a bright orange "bottom", it could be the Asian Hornet. If you've reached this far, it means you probably don't know what type of insects you have, or that you've identified the insect but they're not listed above. If the insect is not listed above then we at North Bucks Beekeepers' Association, who are keepers of honey bees, can't help you. We suggest that you leave these useful native insects alone, and they will leave you alone. Honestly. This is a deadly non-native pest that you have a legal obligaton to report. Please report its presence to the non-native species secretariat. Congratulations! 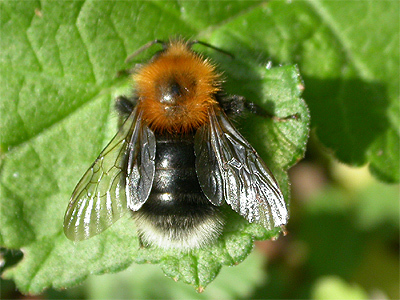 These wonderful little bees have chosen to live near you, and you should feel honoured. These bees will not do you any harm if you leave them alone. They won't damage your building either. They will die off at the end of the summer. Don't annoy them (e.g. don't bang the shed door if they're living in the shed) and they'll ignore you. Please note, a professional exterminator will not destroy these bees. There's not a great deal we can do if you're not even able to differentiate a bumble bee from a honey bee from a wasp, a simple childhood skill. You'll need to identify them and then revist this page to complete this process again. Please don't complete this form again using different options just to get our number. We won't be able to work out what insects you have, let alone advise you on what to do, based on a vague description. Question 2 - are the honey bees in a cluster like this? If the bees are not in a cluster like this, we can't help you. Question 3 - are the bees accessible in a reasonable way? We can't climb up onto your roof, take up your floorboards, dismantle your shed, take out your bricks, or turn up with a huge ladder. If the bees can be reached with reasonable ease (including with a step ladder or a long ladder that you can supply), we can probably help you. If your bees are inaccessible we advise you to simply leave them alone, most species of bee that live in such places will die out naturally at the end of the summer, and won't cause you any problems if you leave them alone. Question 4 - do you agree to our fees? Our volunteers provide a FREE service for honey bee swarms. If we come and the information you've given us is incorrect (e.g. 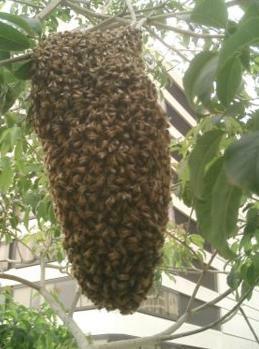 they're not honeybees in an accessible swarm cluster) we may charge an administration fee of around £15. If the bees are significantly out of our volunteer's collection radius, we may charge a small amount for petrol. For bumble bees, our honeybee team may be able to help you for a fee, which you'll discuss on your call. Is that OK? Our hotline wil redirect you to the volunteer on duty this week, but we can only accept voice calls to our hotline number. Don't send a text message or leave a voicemail on the following number. 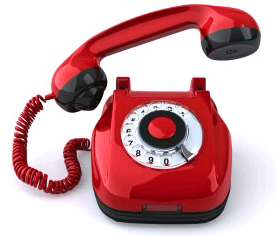 Please phone us, do not send a text message or voice mail. We don't make any money on this call; in fact we pay to provide this service to you and the public. Alternatively please use the national swarm collector finder if you have a swarm.